Nomadic State of Mind has begun their annual spring marketing this year with appearances in Rolling Stone, Surfer magazine, Outdoor magazine and more. The company features their traditional JC sandal in most of their advertising, but this year their Ecolyte sandal will be getting attention as well. 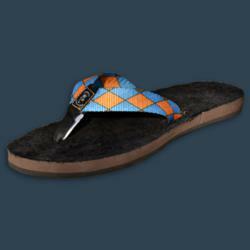 The sandal that rolled out two years ago has been though a number of makeovers and has become a popular flip flop option for the handmade sandal manufacturer. This year the Ecolyte has become a bit funkier than the original. Hemp straps are on the traditional Ecolyte, accompanied by a hemp footbed, a super squishy midsole and a Vibram sole. Comfort is always at the heart of their creations and the Ecolyte is no different. The newer models offer the option of an Argyle or Jaguar print both with a hemp pho fur footbed atop the beloved super squishy midsole and the Vibram sole. These Eco’s are the perfect way to bring some fun into your wardrobe and stand out from the crowd, something Nomadic customers know a thing or two about! The Ecolyte sandal is also made right here in America, which is something the company is proud to offer. Nomadic State of Mind’s apparel line is also made in America out of 100% organic cotton, and their traditional rope sandals are made from American materials and assembled in Nicaragua. The company is focused on social responsibility and this just one of many ways they try to do their part. Nomadic State of Mind was founded nearly ten years ago and is based in North Carolina. Manufacturing takes place both in Florida and in Nicaragua where the company has helped support a small community for the past eight years. Nomadic has always believed in positive contributions to the world around them and is committed to remaining true to their roots. For more information or additional art work please contact Chris Anderson or Shea McNally at 877-666-2376 or http://www.nomadicstate.com.